Quang Ninh Province has completed the relocation of more than 300 households living in the core area of the World Natural Heritage Halong Bay to a new resettlement area in Ha Phong ward, Halong city. However, the local authorities still allow people to make a living in the bay to ensure livelihood for the people who have contributed to the preservation of the unique culture of the fishing villages of Halong bay. Mr Tang Van Phien, Chairman of the cooperative said rowing boats that serves tourists has been operating since 2008 with most members from Vung Vieng fishing village, especially in the early days of when Halong bay in Vietnam was opened to tourists, the backpackers going on cheap tours to Halong bay even stayed overnight on floating houses. Therefore, the majority of people wishing Vung Vieng would later develop into a model of community tourism, with fisheries taken as the core of tourism development. Vu Van Dong, from the old fishing village said his family has moved on shore, he is now back to Vung Vieng rowing boats for tourists so as to feed his family. Although launched a few years ago, but rowing boat service to attract spots in the bay, visit the fishing villages has attracted many visitors, some companies offering Halong budget tours include a visit to the village a part of the itinerary. 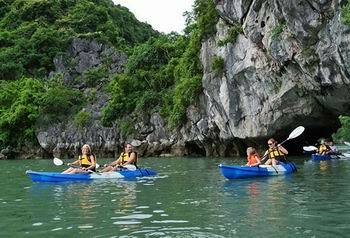 This is one of the very effective ways to diversify tourism products of Halong bay and to keep visitors to stay longer and explore the unique beauty of the world heritage Halong bay.